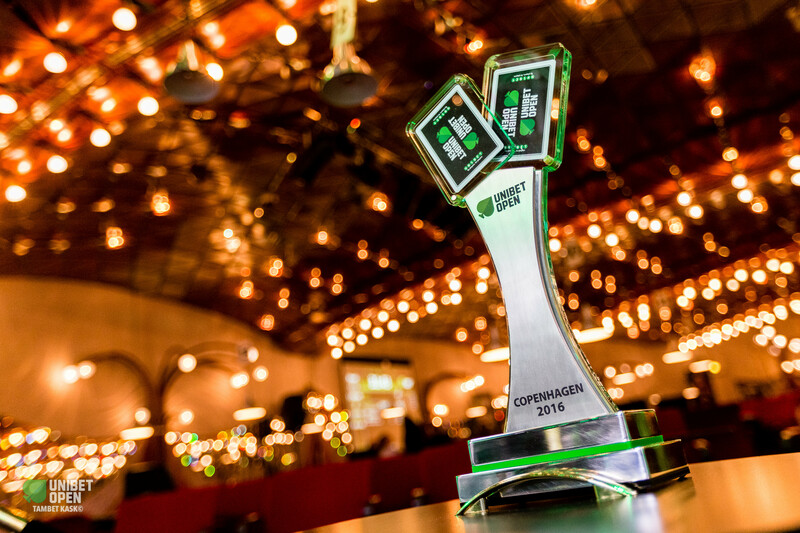 The final day of the Unibet Open Copenhagen Main Event started at noon with still 16 players in contention. It didn't take long to widdle that down to a final table of nine as even before the clock struck 4 it was down to just nine players. After a long final table, Joni Liimatta from Finland from walked away a winner, going home with €70,514 and the Unibet Open trophy. The final day took a total of 10 and a half hours to complete. Before some players had even taken their seats at noon, Tutku Halim Kara had already been eliminated. He was soon joined on the rail by Johan Goslings. The Dutchman, who bubbled the last event in Malta, ran sevens into nines and couldn't come from behind. Before the first half hour had passed, only 11 players remained. From there on out, though, things didn't go as fast. From 11 to the final table of 9 took several levels, with players opting to fold big hands and keeping pots small instead of applying the pressure and blowing up confrontations. 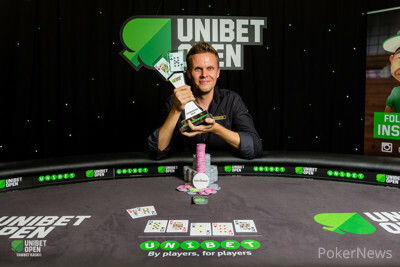 Unibet Open regular Soren Blanner became the player to bubble the final table. He got it in with aces against sevens and saw a seven hit the turn. "Nein! Nein! Nein!" he shouted to no avail as the river bricked. He collapsed and sat hanging on his chair for a good minute before he made his way to the payout desk to collect his cheque worth €6,259. With 9 players remaining, a single table was formed and the official final table photo was taken. Soon after, the first two players busted in the same hand. Rune Thomsen, without a doubt the most animated player at the table, got it in with queens and got called by Robin Sevastik before Alexandru Dan Nistor shoved over the top for a little more with ace-queen. 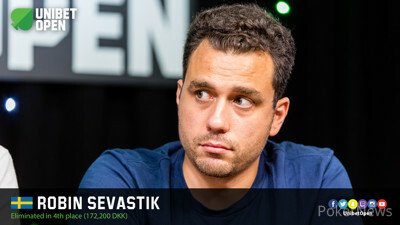 Sevastik called and knocked them both out when he made a flush on the turn. It took some time before the table got slimmer again. Again it would be two players busting, this time in back to back hands. Patrick Coughlin, the sole American, lost a coin flip with king-queen against tens and Srdan Andric followed not much later when he didn't find any help with his combo draw against the set of Daniel Wittikko. Wittikko, who had been a bit tight, even folding ace-king pre-flop to a single raise at one point, felt more at ease in the role of chip leader and it showed. With half of the final table consisting of online qualifiers and at least one of them playing his first ever live event, play was sometimes tight in spots where one might not expect it. Ace-king disappeared in the muck three times before the flop, a limp-folded ace-queen suited 4-handed was shown and several pots that could easily have ended up in huge all ins finished in small pots. It took some time for the next player to make his departure. Lasse Haagensen would be the unlucky one making his exit in 4th place after losing ace-ten to king-queen. Robin Sevastik followed him out the door. Where other players played conservatively, he had no problem calling all in with king-three against a very aggressive Joni Liimatta who was trying to abuse the tight play. Sevastik was ahead against the jack-ten of Liimatta but the jack on the turn spelled doom for him. 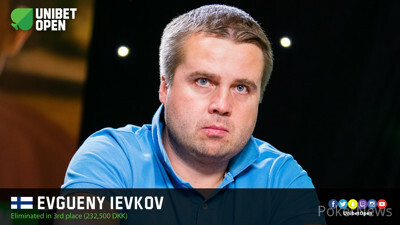 Evgueny Ievkov, an online qualifier and start of day chip leader, ended his first ever live event in 3rd place. He lost with ace-jack to sevens and collected a whopping €31,129. 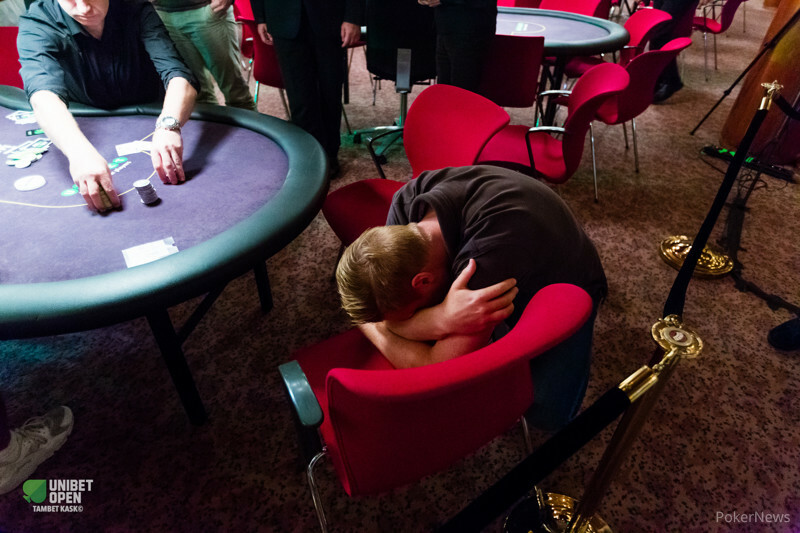 The heads up match between the very aggressive Joni Liimatta and Daniel Wittikko didn't last long. After some shoving without calls, it was eventually Wittikko getting it in good with ace-nine against the king-nine of Liimatta. A king on the flop and river was enough to hand all the chips to Joni Liimatta and Wittikko had to settle for second. The next Unibet Open on the schedule is Unibet Open Bucharest December 1 through 4, 2016. PokerNews will be on the floor for live coverage of that event as well, so try to qualify for that event right now and be part of the Season 9 finale of the most fun poker tour in Europe. 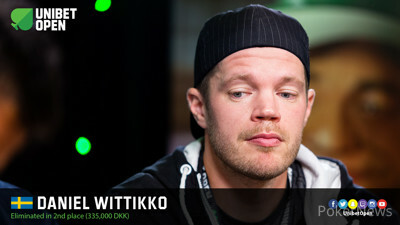 Daniel Wittikko opened his button for 325,000 and action was on Joni Liimatta. Liimatta shoved all in, putting the pressure on Wittikko who decided to call for his 2.8 million stack. Wittikko was in prime position to double up, but the flop didn't do him any good: . The on the turn was a blank and the even made things worse. Daniel Wittikko eliminated in 2nd place for €44,995. Joni Liimatta was once again pushing the action, applying the pressure with this time shoving all in. Evgueny Ievkov, who had folded big hands before, didn't want to get away from and called. Again the dealer didn't showboat and rapidly dealt the board: . Just like that, the tournament was heads up. Joni Liimatta hit the rail in 3rd place receiving €31,129 in his first ever live tournament. Joni Liimatta, having seen people fold big hands a lot, put the pressure on pushing all in with . Robin Sevastik wasn't into folding as much as some others, though, and called with . The board came and with the jack on the turn, Liimatta eliminated his opponent. Evgueny Ievkov raised to 240,000 holding and saw Joni Liimatta push with . Ievkov tanked for a bit before open folding his ace-king. From first position, Lasse Haagensen raised to 200,000 holding . Joni Liimatta next to him with the three-bet to 500,000. Evgueny Ievkov folded and action was back on Haagensen. He shoved all in for 1.8 million. Liimatta asked for a count and called. Haagensen had gotten it in good but the board ran out and he had to make his exit from the event. 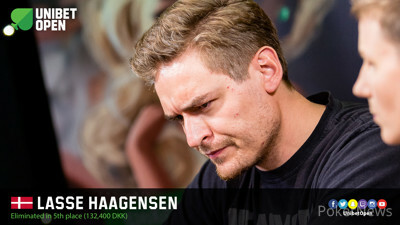 Haagensen was rewarded with a cash of €17,783. The remaining 4 players are now guaranteed €23,129. Joni Liimatta raised to 200,000 with and Daniel Wittikko three-bet to 600,000 holding . Evgueny Ievkov woke up with and shoved all in for 1 million. Liimatta folded and Wittikko made the call saying "I have to call." The board ran out and Ievkov doubled. Evgueny Ievkov got it in with against the of Robin Sevastik before the flop. What could have been an extremely exciting showdown, was done for extremely fast. The dealer rapidly put the board out: . Ievkov fist pumped on the turn, making his ace kicker play. Double up! The Final Countdown; Who's Going to Win the Unibet Open Copenhagen?